The United States has a debt problem—we owe more than $18 trillion while our gross domestic product, the value of all goods and services produced in America, is only $17.5 trillion. To pay down the debt, some recommend austerity, cutting federal expenditures. Others suggest increasing taxes, especially on the wealthiest Americans. 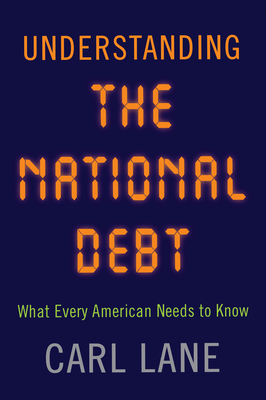 In Understanding the National Debt: What Every American Needs to Know, economic historian Carl Lane urges that the national debt must be addressed in ways beyond program cuts or tax increase alternatives, but change can only occur when more Americans understand what constitutes our debt and the problems it causes. The gross national debt is composed of two elements: the public debt and “intragovernment holdings.” The public debt consists of bonds, bills, and notes purchased by individuals, banks, insurance companies, hedge and retirement funds, foreign governments, and university endowments. Intragovernment holdings refers to money that the U.S. Treasury borrows from other parts of the government, principally Social Security and Medicare. This accounts for approximately a quarter of the gross national debt, but that is money that we owe to ourselves, not another entity. The more the government borrows, the less is available for private sector investment, creating a “squeeze” effect that inhibits economic growth. The most burdensome problem is the interest due each year on the debt. Every dollar spent on interest is a dollar less for other purposes. Those elements of the federal budget which are termed “discretionary” suffer. The mandatory elements of the budget—Social Security, Medicare, Medicaid, and the interest on the debt—must be provided for, but defense and national security, education, energy, infrastructure repair and development, and other needs wind up with less. By understanding the national debt we have an opportunity to address our real debt challenge—its principal and interest. Carl Lane is professor of history at Felician University in New Jersey. He received his PhD from the Graduate Center of the City University of New York. He is author of A Nation Wholly Free: The Elimination of the National Debt in the Age of Jackson, and his articles have appeared in William and Mary Quarterly, Virginia Magazine of History and Biography, and other publications. His article “The Elimination of the National Debt in 1835 and the Meaning of Jacksonian Democracy” in Essays in Economic and Business History won that journal’s James Soltow Award.